There are two basic types of mixers, stand mixers and hand mixers. In general, stand mixers are better at heavier jobs and bigger batches, but hand mixers take up a lot less space and are easier to use. Here’s a closer look at both types. Stand mixers excel at demanding jobs like mixing the thick dough, and serious cooks say they’re a must if you bake regularly or in large quantities. 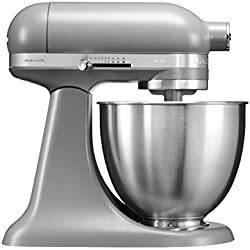 Most stand mixers come with three attachments: a flat beater for mixing batter; a dough hook for kneading; and a wire whisk for whipping cream, etc. Specialized attachments, ranging from enamelled beaters to pasta makers, are also available for some models. Most top-rated stand mixers have a single beater mounted on a disc that rotates around a stationary bowl. Experts say this process, called “planetary action,” is the most efficient means of blending ingredients because the beater can reach the sides of the bowl, reducing the need to stop the machine and scrape the sides. 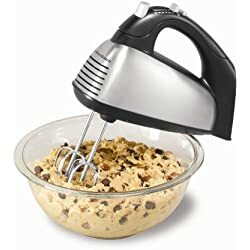 On cheaper stand mixers, the beaters (usually two, like those found on a hand mixer) are stationary; the bowl, mounted on a turntable, revolves around them. Most experts turn up their nose at these less-expensive units, but they suit some people just fine. A hand mixer may be all you need if you bake only occasionally or just need a mixer for lighter tasks, such as whipping cream, mixing cake batter or beating eggs. Many also come with a good array of accessories, for whipping, kneading and mixing. If you value convenience to look for one with a snap-on bin where you can store the accessories to make a neat, compact footprint. You can use a hand mixer in any kind of bowl or even in a pan. 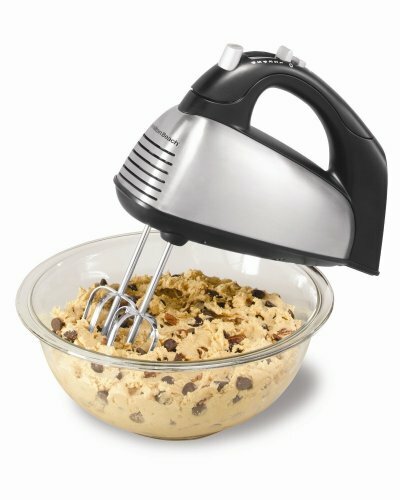 Some hand mixers are powerful enough for jobs like kneading dough and combining thick cookie ingredients but don’t expect a hand mixer to perform those tasks as quickly and easily as a stand mixer. A lot of people own both a stand mixer and a hand mixer so they don’t have to dirty their larger stand mixer for smaller jobs. Will your mixer do that? Keep in mind that a mixer may not always be the best option for the job you need to do. Although a hand mixer can be used to puree soups and scramble larger quantities of eggs, it won’t do so as well as an immersion blender. If you like to make a lot of bread, a bread machine can make quicker, easier work of that task and churn out more consistent loaves. In addition, plenty of bakers find that their food processor works well for kneading the dough, and they tend to be more versatile than mixers. We have separate reports on all of those kitchen appliances. We rarely see one, single product rise to the top across a wide range of expert tests, but the KitchenAid Artisan stand mixer is a rare exception. The Artisan is able to handle thick bread dough or whip delicate frosting with equal ease, and its tilt-head design makes accessing ingredients a cinch. Durability is fantastic, with some models going strong for years; owners unlucky enough to have a problem report attentive customer service. It also comes in a wide range of color options. 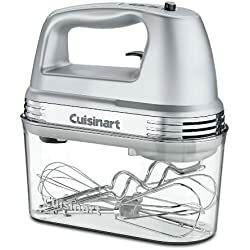 Hand mixers can't fully replace heavy-duty stand mixers, but reviewers say the Cuisinart Power Advantage Plus 9-Speed Hand Mixer comes mighty close. This mixer does a good job with everyday tasks such as mixing batter, beating eggs and whipping butter or cream, and, unlike many of its competitors, can handle the occasional thick cookie and bread dough. The included beaters, whisk, dough hooks and spatula clean up easily in the dishwasher and store conveniently in an included snap-on case. 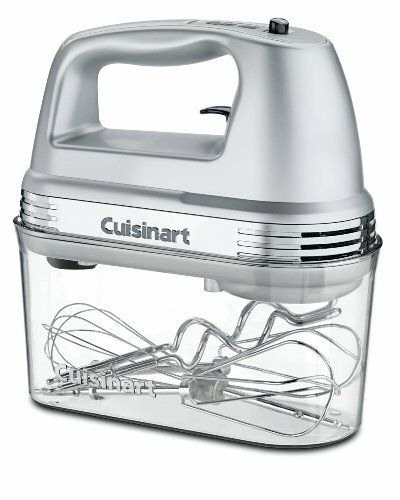 The big news for this update is that Cuisinart has discontinued all but one of their stand mixers, the Cuisinart SM-50. We’ve included it in this report because it’s a terrific mixer. Best of all, right now it’s on sale for a price that makes it an amazing value, too. Otherwise, the expert tests we consulted at Wirecutter, Consumer Reports, Good Housekeeping, Epicurious, Reviewed and elsewhere merely confirm that the classic brands are still the top performers — and owner reviews match up with the experts’ conclusions. We also found some new models that might work better for some people (especially those on a budget or with space limitations in their kitchens). Read on to find out which stand mixers we added to the batch, or, if you’re looking for a hand mixer, you can jump right to that section of the report. (Est. $300) manages to do so. It’s the top pick, after testing, at Wirecutter, Good Housekeeping, Reviewed, Top Ten Reviews and Reviews.com. The only exception to it being the top pick is at Consumer Reports. Editors there do give it a Recommended nod, however, and Excellent scores for whipping, mixing and kneading, but they downgrade it for convenience (Very Good) and noise (Good). 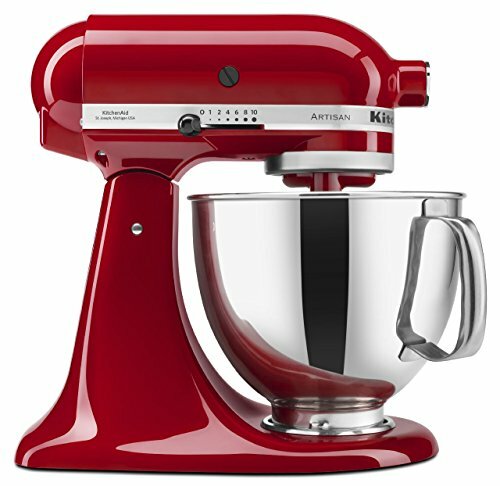 The KitchenAid Artisan is a 10-speed, 325-watt mixer. Some of the tests it was put through at various sites included kneading bread, mixing thick cookie dough and tackling several pounds of meat mixtures for loaves and meatballs. It excelled in all of them, but it also was an exceptional performer at more delicate tasks, such as whipping up creams, meringues and frostings, and creaming butter and sugar into a light, fluffy blend. The Artisan’s 5-quart bowl can mix up enough dough for nine dozen cookies or more than four loaves of bread, but it also can handle small quantities with ease, without the ingredients getting lost or splattered around the bowl. Owners like it just as much as the experts do, giving it 4.6 stars in more than 8,700 reviews at Amazon; equally glowing — or higher — scores elsewhere in many thousands of more reviews. Most call out how easy it is to use, with the tilt-head design offering ample access to add ingredients to the bowl. The bowl has a handle that makes it easy to hold and includes a plastic pouring shield to keep messes to a minimum. One of the Artisan’s most popular features is its array of color options that can complement almost any kitchen décor. The Artisan also has a long-standing reputation for durability, so much so that most reviewers say not to worry about the fact that it comes with only a one-year warranty. Be warned, though: this is a large mixer. It’s heavy and takes up a lot of counter space. If you don’t have room to store it on the counter, be sure you can lift its 26 pounds. (Est. $380) boasts those perks, along with many of the same advantages of its smaller sibling, the Artisan. Among them are versatility, the same much-vaunted durability and plenty of color choices. The Professional 600 is the recommended upgrade at both Wirecutter and Good Housekeeping if you do a lot of baking in large quantities, although Wirecutter notes that it doesn’t perform as well as the Artisan at smaller jobs. It’s also big, 29 pounds, so it’s best left on the counter — but only if you have plenty of room. 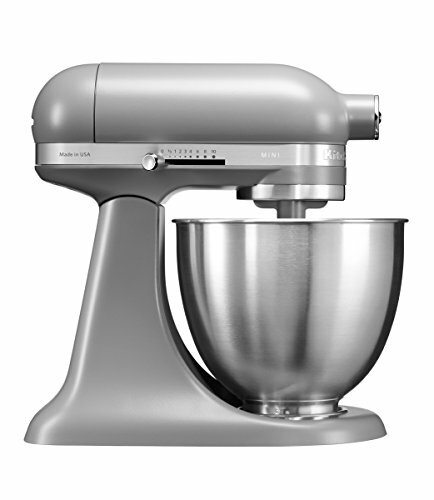 The KitchenAid Professional 600 can yield 13 dozen cookies or more than eight loaves of bread. Its motor offers more power (and makes more noise, testers note) than the Artisan’s: 575 watts compared with 325 watts. The Professional also boasts a heavy-duty burnished aluminum spiral dough hook and flat beater compared with the Artisan’s coated versions. All of these factors combine to make this mixer especially good for frequent bread bakers, owners say. Those tasked with more delicate jobs may want to opt for the Artisan; “the whip didn’t even make contact” when tasked with a single egg white in tests by Wirecutter. There are fewer owner reviews of the KitchenAid Professional 600, but they still number in the thousands — for example, more than 3,700 at Amazon where the Professional 600 earns 4.3 stars. Not quite as good as the Artisan, but we do see more complaints about noise. Some also say the bowl-lift design (which lifts the bowl to the mixer head and attachments instead of vice versa) has a longer learning curve than a tilt-head model like the Artisan. Serious bakers who need a high-capacity mixer are definitely the happiest, while those who bought this for more occasional use don’t seem to be quite sure what they’ve got themselves into. We also spotted more than a few lower reviews that were for problems with refurbished KitchenAid’s — you won’t have those issues unless you purchase a refurb. Like the KitchenAid Artisan, the Scraper Mixer Pro has a 5-quart bowl and a user-friendly tilt-head design that offers easy access to ingredients. It offers a more powerful motor (550 watts versus 325 watts) and more speeds (12 versus 10). Other differentiating features: An LED display shows speed and includes a timer, and there is a scraper beater in addition to a flat beater. Reviewers say the scraper beater effectively keeps the sides of the bowl clear and easily incorporates all ingredients. The Breville BEM800XL Scraper Mixer Pro is available in silver, black and red. It’s slightly lighter than the Artisan at 21 pounds and has a one-year limited warranty. Owners like it well enough, giving it 4.4 stars in nearly 300 reviews at Amazon. A few reviewers report overheated motors, particularly when making bread, so, again, this may not be the best choice for bread fans. (Est. $175). It includes some of the high-end conveniences of the KitchenAid Artisan and its competitors, but at a price that makes it a great value. It’s the number three Recommended mixer in Consumer Reports’ testing, earning Excellent scores for whipping, mixing and noise; Very Good for kneading and convenience. The Eclectrics has a 4-1/2-quart bowl with an ergonomic handle that owners say is very comfortable to use, and it has a pouring shield to guard against spills. It also has an easy-to-operate tilt-head design with a head-lock feature. 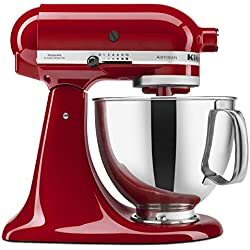 For a lower-priced stand mixer, the Hamilton Beach Eclectrics gets ratings that are close to that of the Artisan’s; 4.4 stars in nearly 1,000 reviews at Amazon, for example, and an even more impressive 4.6 stars at Walmart, albeit in many fewer reviews, just under 200. Most owners say it’s an extremely sturdy, well-performing mixer that handles both heavy jobs and those that require more finesse, like whipping cream. The mixer is reportedly easy to use, and the only consistent complaint we saw was that the release button for the head is awkwardly placed. The Hamilton Beach Eclectrics comes with a generous three-year warranty, but the company’s customer service gets mixed reviews. The mixer comes in black, white, silver and red. (Est. $190). That price is for the brushed chrome; the white was selling for around $170, while the other colors were going for $180 to $250. Still, not a bad price for a mixer that usually retails for $250 regardless of the color. 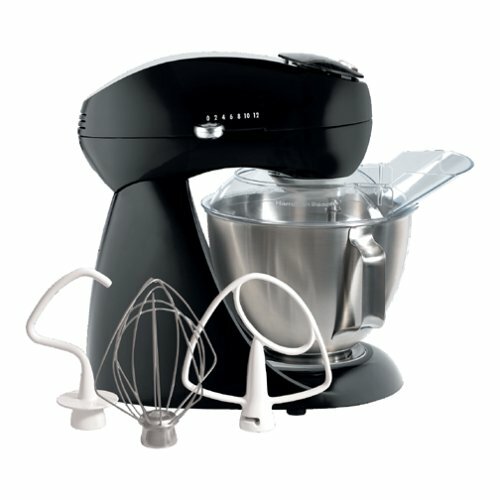 The SM-50 is currently the only stand mixer Cuisinart makes, all the other SM models have been discontinued (although they’re still available here and there, in limited quantities). It’s the budget option at Reviews.com, where they note that it’s almost as powerful as the Artisan. In testing there, it was particularly good at scraping the bowl while making batches of cookie dough — definitely a time saver if you make a lot of cookies. They note that it’s a bit slower than the Artisan, but say it’s worth it for the lower price (and it was $250 when they did their review). Owners give the Cuisinart SM-50 very high ratings — 4.6 stars at Amazon, although in just around 65 reviews. It also has a number of optional attachments available, such as a spiralizer, pasta extruder and meat grinder. Unfortunately, the attachments get terrible reviews, so we recommend it just as a mixer. 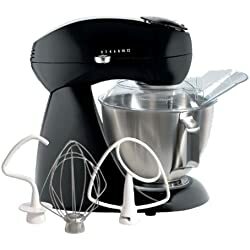 The Cuisinart SM-50 includes a whisk, dough hook, and flat mixing paddle. The 5.5-quart bowl has a splash guard with a pour spout. It features 12 speeds and a tilt-back head, just like the Artisans.